1.1. In medium saucepan or large bowl, stir salt and 2 quarts cold water until salt dissolves. With skewer, poke several holes in skin side of chicken. Add chicken to salt brine; cover and refrigerate at least 2 hours or up to 4 hours, turning chicken once halfway through brining. Remove chicken from brine and pat dry with paper towels; discard brine. 2.In bowl, cover wood chips with warm water; soak as label directs. Prepare outdoor grill for indirect grilling over medium heat. In small bowl, mix chile powder, coriander, garlic powder and black pepper; sprinkle on both sides of chicken. 3.Drain wood chips; place 2 cups wood chips on each of two 12-inch square sheets aluminum foil. Loosely wrap foil around wood chips; with skewer, poke holes in foil to vent. Place 1 foil packet under grill rack over lit burner. Place chicken, bone side down, on hot grill rack over unlit part of grill; cover and cook 1 hour. Replace used foil packet with second foil packet; rotate chicken and add peppers, cut side down, over unlit part of grill. Cover and cook 1 hour longer or until internal temperature of chicken reaches 165°. Transfer chicken and peppers to cutting board; loosely tent with foil and let stand 15 minutes. 4.With fingers, pull chicken off bones in long, bite-size shreds; thinly slice bell peppers. 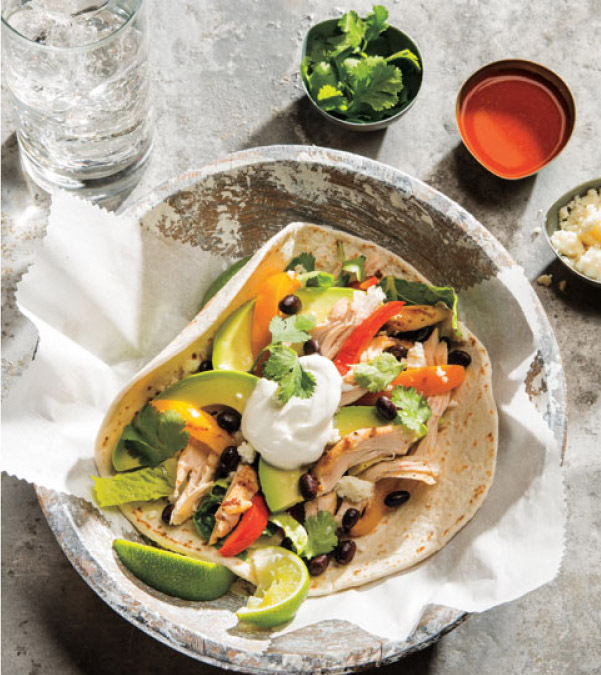 5.Evenly divide chicken into tortillas; evenly top with lettuce, beans, queso fresco, sour cream, avocado, cilantro and bell peppers. Serve with lime wedges and hot sauce, if desired.